Custom molded 1 oz milk or dark chocolate bar with custom wrapper. Designed to provide endless promotional opportunities. Full color graphics on the wrappers and sleeves. 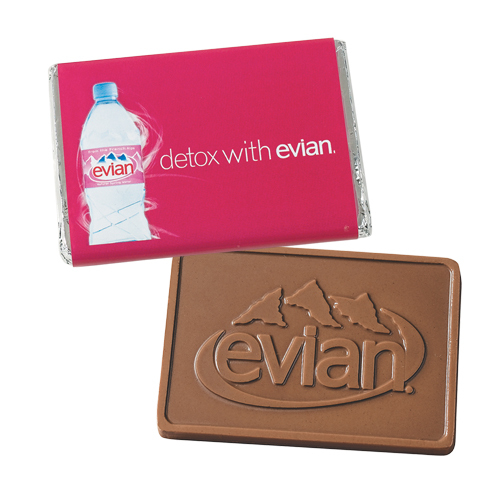 Imprint the chocolate with your logo. Kosher certification available. 3 1/4" x 2 1/4"
• Custom Mold Charges for Chocolate Bar are Additional. See Options Tab for Additional Imprint Options and Pricing. • Packaging: The original wrapper color is white. Each bar is gold or silver foil wrapped, then overlaid with the custom wrapper.